Pakistan has 109 informal entrepreneurs for every formally documented entrepreneur, ranking the country 4th in the world for the size of its shadow economy, according to a study published by Professor Erkko Autio and Dr. Kun Fu of the Business School of London's Imperial College. Pakistan's 109 shadow entrepreneurs for every officially registered one rank it 4th behind Indonesia's 131, India's 127 and the Philippines' 126. Egypt ranks 5th with 103 shadow entrepreneurs. The U.S. appears at number 32 on the list with 2.37 unregistered businesses for each registered one, while the UK exhibits the lowest rate of shadow entrepreneurship among the 68 countries surveyed, with a ratio of only one shadow economy entrepreneur to nearly 30 legally registered businesses. Shadow entrepreneurs are individuals who manage a business that sells legitimate goods and services but they do not register it. This means that they do not pay taxes, operating in a shadow economy where business activities are performed outside the reach of government authorities. The shadow economy results in loss of tax revenue, unfair competition to registered businesses and also poor productivity - factors which hinder economic development. As these businesses are not registered it takes them beyond the reach of the law and makes shadow economy entrepreneurs vulnerable to corrupt government officials. In a study of 68 countries, Professor Erkko Autio and Dr Kun Fu from Imperial College Business School estimated that business activities conducted by informal entrepreneurs can make up more than 80 per cent of the total economic activity in developing countries. Types of businesses include unlicensed taxicab services, roadside food stalls and small landscaping operations. A 2011 World Bank report titled "More and Better Jobs in South Asia" showed that 63% of Pakistan's workforce is self-employed, including 13% high-end self-employed. Salaried and daily wage earners make up only 37% of the workforce. M. Ali Kemal and Ahmed Waqar Qasim, economists at Pakistan Institute of Development Economics (PIDE), have published their research on their estimates of the size of Pakistan's shadow economy. They have explored several published different approaches for sizing Pakistan's underground economy and settled on a combination of PSLM (Pakistan Social and Living Standards Measurement) consumption data and mis-invoicing of exports and imports to conclude that the country's "informal economy was 91% of the formal economy in 2007-08". While Pakistan's public finances remain shaky, it appears that the country's economy is in fact healthier than what the official figures show. It also seems that the national debt is less of a problem given the debt-to-GDP ratio of just 30% when informal economy is fully comprehended. Even a small but serious effort to collect more taxes can make a big dent in budget deficits. My hope is that increasing share of the informal economy will become documented with the rising use of technology. Bringing a small slice of it in the tax net will make a significant positive difference for public finances in the coming years. 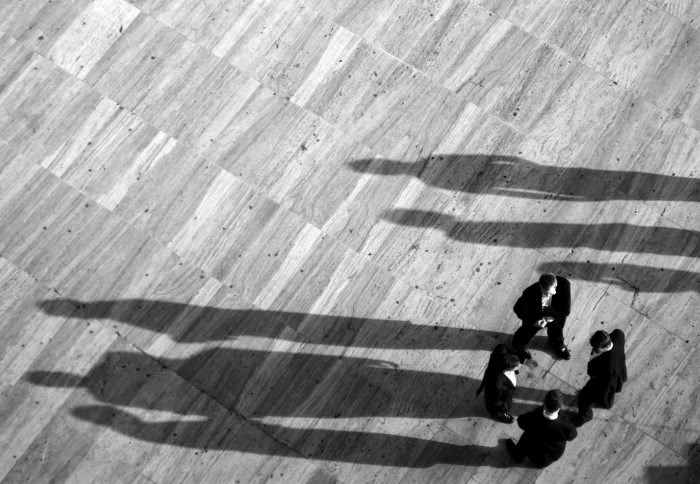 Why Do Entrepreneurs Operate in the Shadow Economy? What is the “rule of law” and why does it matter for entrepreneurs? In this video, Democracy that Delivers for Entrepreneurs keynote speaker Hernando de Soto explains how the legal and institutional structures that entrepreneurs and business people in the developed world take for granted are sorely lacking in many developing countries. As a result, those who want to start a business are often forced to operate in the shadows — lacking formal registrations, licenses, and any protection for their property. De Soto’s organization, the Institute for Liberty and Democracy (ILD), estimated that up to five billion people may be completely shut out of the legal system. The results can be catastrophic and even world-changing. When Tunisian fruit peddler Mohamed Bouazazi had his cart, scale, and inventory confiscated by a police inspector in 2011, he was so despondent that he set himself on fire — igniting the Arab Spring that brought down several governments around the region. Bouazizi’s name has now gone down in history, but he was not alone. ILD has found dozens of informal entrepreneurs around the Middle East and North Africa who immolated themselves for similar reasons. In a much less dramatic fashion, these kinds of institutional barriers to entrepreneurship stifle economic growth and opportunity around the world on a daily basis. The term social enterprise may be relatively new in Pakistan but it is gaining popularity in its areas of development. While it may be an unfamiliar concept for many engaged in local grassroots businesses they can nevertheless see the potential of engaging in ventures which have a social impact. According to the Opportunity Pakistan Report – produced by i-genius, an initiative supporting social entrepreneurs worldwide – despite the country’s social and political unrest, it offers opportunities for investment and innovation. “Countries experiencing transition are fertile places for new ideas to thrive”, said Shivang Patel, commission coordinator of i-genius. “Despite media attention in the west on all things bad in the region we found a country progressing through slow but significant positive reforms. There is considerable untapped potential for social businesses”. A new wave of creative and confident young entrepreneurs has emerged developing innovative start ups in areas such as environment, health and skills. Scores of young women and men from remote areas of Pakistan are becoming social entrepreneurs. A longstanding lack of investment in Pakistan’s public sector has prompted local business leaders to invest in ideas which tackle issues such as water and sanitation problems as well as those which can address its energy and environmental concerns. One such example is Pharmagen Water. Established in 2007,it aims to provide poor communities in Pakistan’s second largest city, Lahore, with affordable clean and purified drinking water. It is supported by the Acumen, which invests in entrepreneurs and creates venture capital which can provide solutions to causes of poverty. Another business offering a solution to parts of Pakistan’s energy strapped areas is SRE Solutions. Established just last year with Acumen’s support it offers to harness solar energy for off-grid customers in districts of Punjab and Khayber Pakhtunkhwa provinces. The initial funding for Ghonsla’s pilot project came from Seed, Social Entrepreneurship and Equity Development, a venture which supports startups and grassroots innovations. Its incubation centres in Pakistan provide opportunities for young entrepreneurs in their early years of startup. Small is beautiful - unless you are a business that wants to grow. In which case, small is not so appealing. In Pakistan, where 90 percent of businesses are small or medium, challenges to scaling-up businesses have kept the private sector from realizing their full potential and contributing as much as they could to the economy. To help address a major constraint to the growth of small and medium enterprises (SMEs) in Pakistan, the U.S. Agency for International Development (USAID) is partnering with local banks to boost lending to SMEs. The new $60 million "U.S.-Pakistan Partnership for Access to Credit" was launched at last week's U.S.-Pakistan Business Opportunities Conference, as part of a larger bilateral government effort to boost trade and investment in Pakistan. Finance is an important enabler of economic growth anywhere in the world. For Pakistan, which needs annual economic growth of at least 7 percent just to keep up with the number of youth expected to enter the labor market each year, this financing is important not only for the economy but for stability. Yet the private sector credit to gross domestic product (GDP) and financial depth ratios in Pakistan trail behind leading emerging economies. In the SME segment, the volume of lending and types of financing tailored to SME needs have been very limited. A World Bank study found that only 16 percent of total credit in Pakistan went to SMEs. Moreover, about 70 percent of SME borrowing was used for working capital while only about 12 percent went toward long-term investment. Another survey shows only 11 percent of micro, small, and medium enterprises (MSMEs) in Pakistan report having access to finance, below the 15 percent international average and well below percentages reported in higher performing middle-income countries like Brazil and Turkey (30 and 48 percent respectively). Despite these limitations, SMEs make an out-sized contribution to Pakistan's economy. The same World Bank study found that SMEs in Pakistan employ nearly 70 percent of workers in the manufacturing, services, and trade sectors and generate an estimated 35 percent of manufacturing's value addition. They also contribute over 30 percent of GDP and more than 25 percent of export earnings. Thus, alleviating a key constraint to their growth could lead to substantial increases in the number of jobs for Pakistan's large number of youth and greater income generation. The new Partnership reflects a shared commitment to promote broad-based economic growth in Pakistan. Private sector investment was identified as an essential ingredient for growth in the Government of Pakistan's Vision 2025 strategy. The Partnership is part of a larger umbrella of U.S. support to SMEs in Pakistan to help them grow and expand into new markets. It will provide partner banks- Bank Alfalah, JS Bank, Khushhali Bank and First Microfinance Bank- with a loan portfolio guarantee through USAID's Development Credit Authority (DCA). The guarantee will lower the risk to the banks for lending in sectors they would otherwise perceive as being too risky. It will also encourage partner banks to extend longer-term loans and introduce credit products that address the needs of SMEs. With more access to finance, small and medium businesses are poised to make even larger contributions to the Pakistan economy than they do now. The new U.S.-Pakistan Partnership for Access to Credit will make it possible for dynamic SMEs to be more than small and beautiful. After all, beauty is in the eye of the beholder and for businesses eyeing scale-up, there are few things more attractive than being able to grow. magnitude, who is engaged in underground activities, and the frequency of these activities. data sample used in Schneider and Buehn (2009) and Schneider and Enste (2000). countries, thus creating a unique data set that allows us to compare shadow economy data. The National Sample Survey (NSS), when launched by the NSSO in 1949, was the most ambitious household survey in the world, covering over 1,800 villages and over 100,000 households across India. The methods used by the NSS became the standard for household surveys the world over. For example, the use of inter-penetrating samples — essentially, two independent samples drawn from the same population — to test the reliability of the survey results, was developed by Mahalanobis in a 1936 paper and remains a standard tool for survey design. The Living Standard Measurement Surveys the World Bank still carries out in many countries are a direct descendent of the NSS. We quibble about whether growth was 7.1% or 7.4%, ignoring the fact that our two main sources of official consumption data, the NSS and the GDP data produced by the Central Statistical Organisation (CSO), now tell entirely different stories. If you believe the NSS, GDP could be just about half of what it is according to the CSO. There are occasional academic debates about which one is correct, which no one in power pays any attention to. And yet, it is almost surely true that both estimates (and their growth rates) are off by a huge margin. More worrying, this divergence has been known for nearly 50 years (though it has grown a lot). And though we are occasionally told that the NSS is understaffed, or that no one knows where the CSO got a particular number, there is absolutely no political interest in improving things. From being the world leader in surveys, we are now one of the countries with a serious data problem while people talk about the really good data you can get in Indonesia or Brazil or even Pakistan.